A storm which consists of snow and rain that has been happening in Lebanon for five days has left an 8-year-old Syrian girl dead. The also flooded neighborhoods and paralyzed major mountain roads. 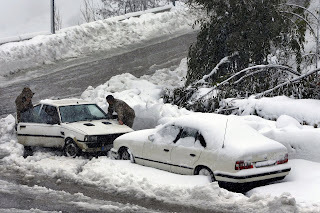 In the village of Dahr el-Baydar, several bulldozers were working on opening the highway that links Beirut with the Syrian capital Damascus what was covered with about one-meter (yard) of snow.